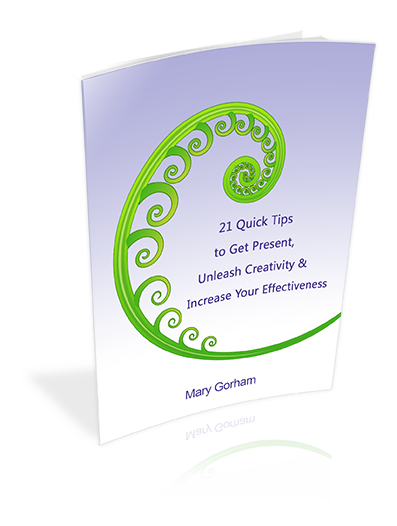 The 21 quick tips in this guide are all techniques that help us be our best. They stem from the premise that one of the most powerful ways we can influence our results is through the mindset we bring to what we do. The reason for this is it is our mindset at any given moment that serves to determine what we see, what we don’t see, how we interpret what we see, and therefore, how we respond to what we see. The more present and creative our mindset, the more apt we are to see new possibilities and ultimately increase our effectiveness. This is true for us individually as well as in our teams and organizations. These tips are a distillation of my own 30 years of experience, as well as insights from the world’s best thought leaders on these topics. If you prefer not to receive these, you can unsubscribe at any time.